The “blame the buildings” series (here, here, and here) was meant to emphasize how energy use in buildings accounts for a bigger chunk of total CO2 emissions than is generally recognized. Of course it also matters where buildings are located relative to other buildings and services, since location has a big impact on transportation-related CO2 emissions. The Urban Land Institute has just published a report called “Growing Cooler,” that attempts to quantify the effects of land use patterns on transportation-based CO2 emissions. The authors conducted an extensive literature review, which revealed that, as a rule of thumb, compact development reduces driving by 30 percent. And the bottom line: by 2050, if 60 to 90% of new development is compact as opposed to status-quo sprawl, transportation-related CO2 emissions would be reduced from current trends by seven to ten percent. Seven percent may not sound like much, especially when you factor in that transportation accounts for about 1/3 of total CO2 emissions, so that we’re actually only talking about a two percent total reduction. But, as the authors note, that seven percent reduction must be appreciated in perspective. 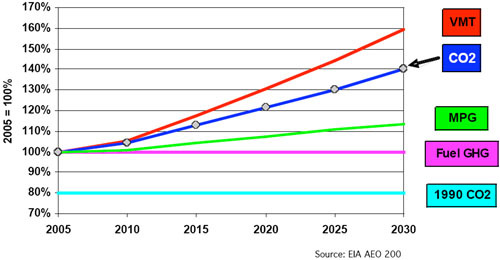 Assuming business as usual, the U.S. Energy Information Administration currently forecasts that between 2005 and 2030 vehicle miles traveled by cars and light trucks will increase by 59%, with a corresponding increase in CO2 emissions of 41%, as shown in the graph below. In the context of of motor vehicle fuel efficiency, the authors estimate that if 60 percent of new development is compact, by 2030 the transportation-related CO2 emissions reductions would be equivalent to raising the U.S. fleetwide efficiency to 32 mpg by 2020. Thus, every resident of a compact neighborhood would provide roughly the same environmental benefit as driving a hybrid does today. The seven percent also does not include CO2 emissions reductions that would result from the higher energy-efficiency of buildings in compact developments (estimated at 20 percent), or from the forests that would be preserved with compact development. Overall, what all this is saying to me is that there will be no magic bullet solutions. CO2 emissions are so deeply embedded in our way of life that we must go after every potential means for reductions, as aggressively as possible. The authors of the ULI report were probably hoping to be perceived as realistic by choosing 60% compact development as a goal. We need to be shooting for 100%. Posted by dan bertolet on	Sunday, January 13th, 2008 at 11:55 am. You can follow any responses to this entry through the RSS 2.0 feed. You can leave a response, or trackback from your own site. IIRC, that report (or a similar) showed that SFA uses far less energy than SFD (common walls lose less energy). I’m not familiar with building energy savings from “compact developments”, unless the gains from res over commercial is factored in. We must also look at the savings of a 1500 sf home vs a 3000 sf home, energy losses through commercial fenestration or transparency code (“but it makes our streets walkable! !”), the fight the Rocky Mt News is waging against replacing incandescents with CFLs, drugging our youth by placing them in front of an electronic device, etc. These are easy wins to gain efficiencies (OK, maybe not taking away the Xbox, but still). But changing lifestyle choices as a solution, no. Not until we start charging for waste and real prices for energy. Will that happen? Maybe when Danny’s kids are my age. Will it be in time? Eh.